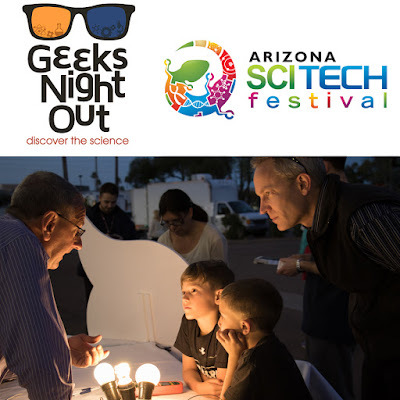 Rio Salado College | RioNews: T-Minus One Day for Geeks Night Out-- March 20! T-Minus One Day for Geeks Night Out-- March 20! Time to break out the lightsabers, capes and curiosity for Geeks Night Out, Wednesday, March 20, at the Tempe Community Complex. Geeks Night Out is the ultimate, family-friendly gathering for people who love exploring the wonders of science, technology and innovation! Free and open to the public. Rio Salado is proud to serve as a partner in this annual City of Tempe Arizona SciTech Festival. Be sure to stop by our booth and join STEM Faculty Chair Rick Vaughn and Faculty Chair of Applied Technology Richard Cuprak to learn about the latest trends and technologies that are improving our world. Check out this video for a preview of what to expect in 2019! Pictured above is Richard Cuprak wowing Geek Night Out attendees in 2017.